A prominent Obama fundraiser and former Democratic politician could face criminal and civil charges for his role in MF Global’s bankruptcy and the company’s loss of more than $1 billion in customer money, Fox Business has reported today. 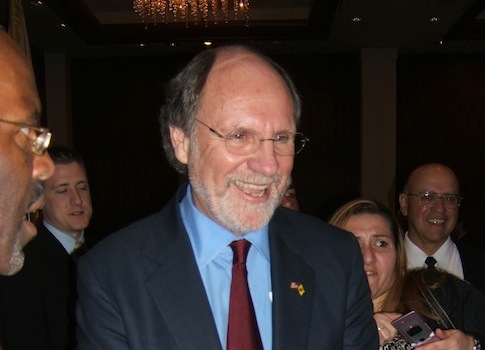 Jon Corzine, MF Global’s CEO and New Jersey’s former Democratic governor, has been fingered by MF Global’s North American chief financial officer, Christine Serwinski, for complacency in the company’s loss of customer funds totaling $1.6 billion. She told investigators that Corzine "was well aware of the use and possible misuse of the customer funds during the firm’s final days," Fox reported. Congress has been investigating the scandal for over a year, and Corzine told Congressional investigative panels that he never instructed the company "to misuse customer money." Congressional Republicans have expressed concern over the lack of charges brought against Corzine by the Department of Justice, pointing to his White House connections. By law, customer funds must be kept separate from other company operation funds, and any company use of these separated funds is subject to strict regulation. Under Corzine’s direction, MF Global "made an outsized bet on the debt of troubled European countries," forcing the company to dip into customer funds after disclosing the bet. This move triggered a financial catastrophe that quickly led the company to the brink of bankruptcy, Fox reported. The company couldn’t account for about $1 billion in customer funds to finalize its sale to Interactive Brokers, "forcing its bankruptcy filing on October 31 of last year, and subsequent liquidation." Corzine could be facing jail time for his role in the loss of the money. This entry was posted in Politics and tagged Crime Blotter, Cronyism, Democratic Donors, Financial Industry, Jon Corzine. Bookmark the permalink.